I meant to put this post up back in March, but I’ve only just got around to sorting out photos for it. Since before I was 18, I wanted this tattoo and finally when I got to the age of 20, I bit the bullet and got it started. I went to Sarah at Mother of All Sins in Sutton Coldfield, who I would 100% recommend especially if you’re wanting a colourful tattoo or Disney tattoo! You can check out her work here. My tattoo is based on the Kingdom Hearts Princesses of Heart, even though Ariel is not actually one of them. I found the design for the inner circle a long time ago and my tattoo artist adapted it and designed the frame – which I think is incredible. 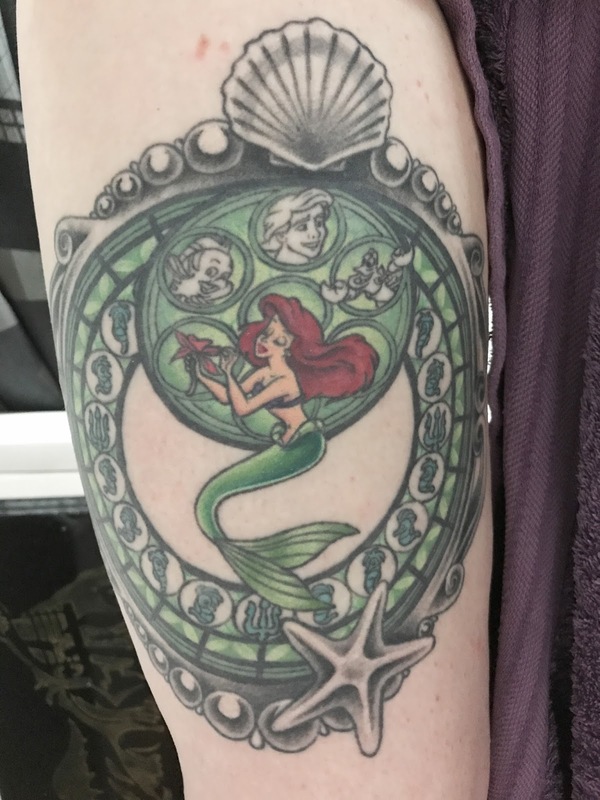 Ariel is my favourite Disney Princess and always will be, which is why I decided to get the tattoo in the first place. I also love Kingdom Hearts and think the Princesses of Heart mosaics are beautiful! I think a lot of people judge Disney tattoos but they’re one of my favourite types, a lot of people have said my tattoo is very ‘me’. My tattoo was started on the 22nd April 2016, the photo above is everything I got done on it that day. Everyone has an expectation of pain from speaking to people with tattoos before getting their first one done, but everyone’s pain threshold is different so it’s impossible to describe. I was quite naive because when the outline was being done, I thought ‘This doesn’t hurt at all’. How wrong was I! When she started colouring in and shading I was in so much pain and after a good 5-6 hours, had to stop and come back to get it finished. I finally got my tattoo finished on the 17th February 2017 and I absolutely love it. This time it was all shading and colouring so it hurt a lot but it was bearable, I also didn’t have to sit as long as I did before. 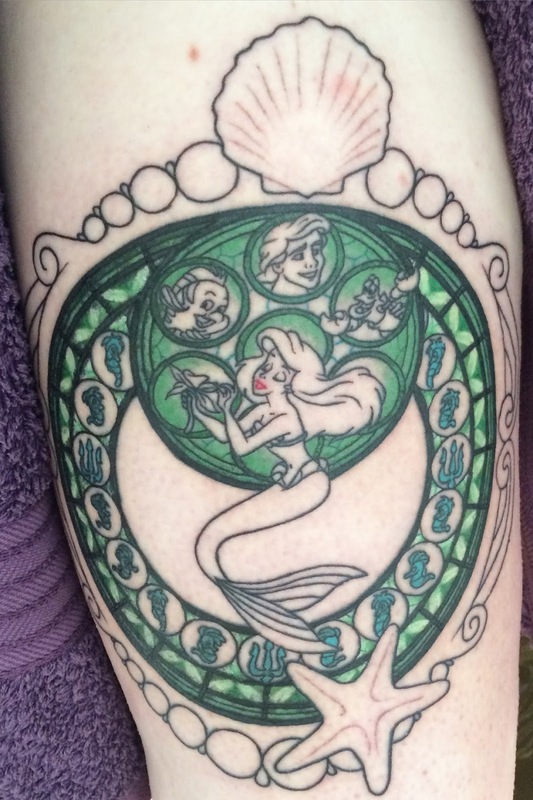 I was so happy to finally have Ariel coloured in and the border shaded! I’ve been planning another tattoo since I first got this one started, which I’d like to get within the next year but I need to decide on placement.